A non-anomalous specimen of Homarus gammarus. Special Containment Procedures: Foundation agents within aerospace organizations are to monitor for discovery of SCP-3485. Class-A amnestics are to be administered to personnel with memories of SCP-3485. In the event that the discovery of SCP-3485 is published, false information is to be disseminated flagging it as a hoax. Description: SCP-3485 is an extranormally large specimen of Homarus gammarus, or common lobster, located seventeen light-years away from Earth. SCP-3485 measures approximately 1.57 x 106 kilometers from head to tail. For comparison, the Sun is 1.39 x 106 kilometers in diameter. Multiple major differences have been noted between SCP-3485 and non-anomalous lobsters, aside from its massive difference in size. Firstly, the carapace of SCP-3485 is abnormally resistant to damage. In multiple instances, collisions with exo-planets have left no signs of damage. In addition, SCP-3485 shows no signs of burns or radiation damage from its regular, extended contact with small stars. Secondly, SCP-3485 has a complex digestive system adapted to its esoteric diet. The primary food source of SCP-3485 is residue created by stars during fission reactions, such as leftover hydrogen and helium. SCP-3485 has also been observed to feed on star material by itself; feeding is accomplished using heat-resistant tendons located in its mouth. To digest this material, SCP-3485 has an extremely efficient digestive system that uses a poorly understood nuclear reaction to process material. This digestive system is capable of complete mass-energy conversion and produces no waste products. Thirdly, SCP-3485 has an efficient transportation system that negates the need for nutrients and oxygen. The bloodstream of SCP-3485 does not use blood, but rather a highly conductive gaseous solution to transport electrical energy. In addition to this, multiple high-efficiency recycling systems replace regular respiratory procedures responsible for life. This fluid also heats up during energy transportation, generating enough heat to keep SCP-3485 alive, essentially negating the Square Cube Law. Finally, SCP-3485 is capable of instantaneously teleporting itself to other stars to use them as a fuel source. It is unknown how SCP-3485 accomplishes this. 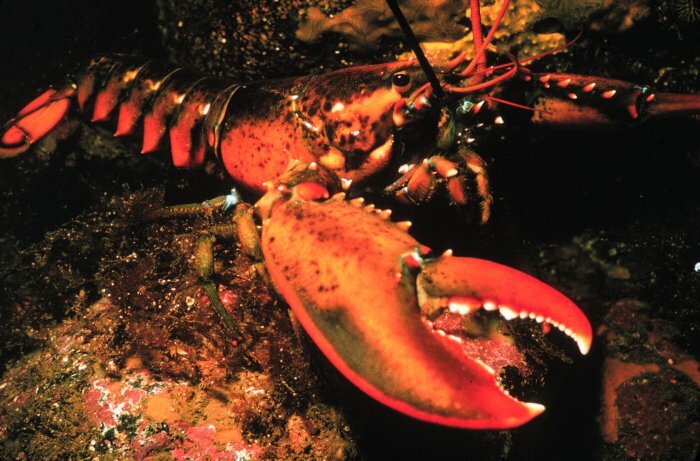 Aside from these modifications, SCP-3485 has the same systems as a non-anomalous lobster, although scaled up by several magnitudes. SCP-3485 is normally very sluggish, due to its large size and the time required for nervous signals to travel across its body. However, it is unknown how SCP-3485 does not collapse according to the rules of gravity, or how it is biologically immortal. Discovery: SCP-3485 was discovered by amateur astronomer Ronald ███████ in 1998. He attempted to publish his findings in a scientific journal, and was met with mass ridicule. The Foundation discovered SCP-3485 after investigating ███████'s findings in 2001. 09/08/2001: Atmos Telescope is directed towards [EXACT COORDINATES REDACTED]. SCP-3485 is observed to be feeding off of a smaller star. SCP-3485 is classified in the Foundation database. 04/05/2003: SCP-3485 observed to transport itself to another star. First recorded movement of SCP-3485. 06/07/2004: SCP-3485 transports itself to the Crab Nebula. It stays there for 3 hours before returning to its star. 09/30/2004: SCP-3485 transports itself to the Crab Nebula once again. 08/22/2007: SCP-3485 transports itself to another star in the [REDACTED] region, and discovers SCP-3485-1 in orbit of it. SCP-3485-1 appears to be the shell of another specimen of SCP-3485. 06/25/2007: SCP-3485 transports both itself and SCP-3485-1 to the star it was previously stationed at. 06/27/2007: SCP-3485 observed to feed star material directly into SCP-3485-1's mouth. 08/14/2008: SCP-3485 transports itself and SCP-3485-1 to the Crab Nebula. 09/01/2008: SCP-3485 and SCP-3485-1 return to the previous star. 10/12/2008: SCP-3485 attempts to initiate mating rituals with SCP-3485-1 and fails. 11/12/2008: SCP-3485 attempts to initiate mating rituals again, and fails. 11/25/2008: SCP-3485 uses its claws to create a hole inside of SCP-3485-1, revealing it to be hollow. 11/26/2008: SCP-3485 incinerates SCP-3485-1 in the star it is orbiting. 11/28/2008: SCP-3485 reaches into the star, possibly in an attempt to recover SCP-3485-1. Its claws are burnt as a result. 12/05/2008: SCP-3485 transports itself to the Crab Nebula, and remains there until 04/12/2008. 04/12/2008: SCP-3485 transports itself to a third star, and resumes normal behavior. 05/06/2014 - 05/13/2014: 2014 expedition to SCP-3485 occurs. Data is gathered. 09/12/2015: SCP-3485 transports itself to an area of space in the [REDACTED] region, despite the lack of stars or any discernable food source. 03/03/2016: Due to the fact that SCP-3485 has not moved from its area since 2015, and that it might starve itself, the 2016 expedition commences. 03/05/2016: Dr. ███████ notes the similarities between the area SCP-3485 inhabits and previous sites of Class C "Broken Entry" wormholes. 03/07/2016: The 2016 expedition ends.